I tell you, I am a sucker for these loss-of-innocence sorts of coming-of-age stories. A kid in another time goes through a traumatic event that forces him or her to grow up way too fast, and I just melt all over the page. I dunno why, I guess it's just so ripe for emotional honesty and heart string-tugging. So that's what drew me to this book, set in small-town Minnesota during the summer of 1961. Twelve year-old Frank is the son of a Methodist minister in the town, along with his stuttering younger brother Jake and older sister Ariel. It's a troubling summer for the town, as the book opens with the death of an young boy hit and killed by a train. There are some questions about the accident-or-not nature of the incident and curiosity drives Frank to walk out to the trestle where the boy was killed. There he spots a Native American man hovering over the body of a dead itinerant. Then more deaths follow, and Frank's family must face larger questions about their faith. I liked this book enough to keep turning the pages, to want to find out the answer to the mystery at the center. Yet, there were several aspects of the book that made me crinkle my nose in confusion and frustration. A lot of the twists and turns in the plot are revealed to us by Frank's tendency to eavesdrop on his father's conversations with the sheriff. That strikes me as a lazy form of storytelling. Once or twice might have been okay, but then it just kept happening and it began to feel as though Krueger simply had no other way to reconcile the need to reveal police activity with the adolescent narrator who shouldn't be privy to these types of conversations. 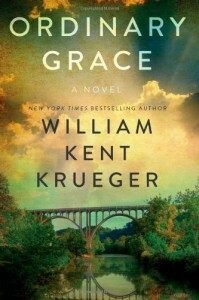 My other concern is the many events happen in this book that either do little to advance the actual plot or provide legitimate character development (such as when Frank's father pays a visit to a woman whose husband is physically abusive) or do little more than to serve as a diversion from the real answer to the mystery (obviously, this is a pretty spoiler-ific area but: the death of Bobby Cole and the itinerant never amount to anything but to cast suspicion on an innocent man, and subsequent character deaths and a suicide attempt do nothing but add to the death toll). Still, I wanted to know what happened and Krueger did throw his readers some surprising curveballs. I liked Frank and Jake and I was intrigued by Krueger's exploration of what it means to hold onto or give up on your faith in difficult times. There were times when I expected that I'd give this book a higher rating, but I ultimately found that it sat somewhere in the middle.